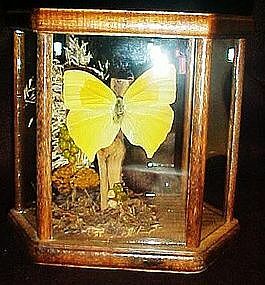 A pretty yellow butterfly is mounted in a realistic setting and is enclosed in a glass sided display. Wood top and bottom is stained and varnished nicely. 6 1/2" tall and is 6 5/8" at the widest point. Beautiful condition. If you like this one, you may be interested in the larger one I have not listed yet with a 2 butterfly display also.